In the summer time, I'm always looking for any excuse to throw a party. There's no way I'm staying indoors when the weather is this beautiful. As a born & raised FL girl I love bringing the tropics to Wisconsin. Whether it's a weekend cookout or "we're halfway to Friday" weeknight happy hour you don't need a reason to get together with girlfriends! You also don't need to spend a ton of money on decorations to evoke a mood for your get together. There's no need for fuss for a casual party, just have fun! For this beachy spirits & sweets happy hour all I had to do was repurpose a few decor pieces I had around the house to set the mood. 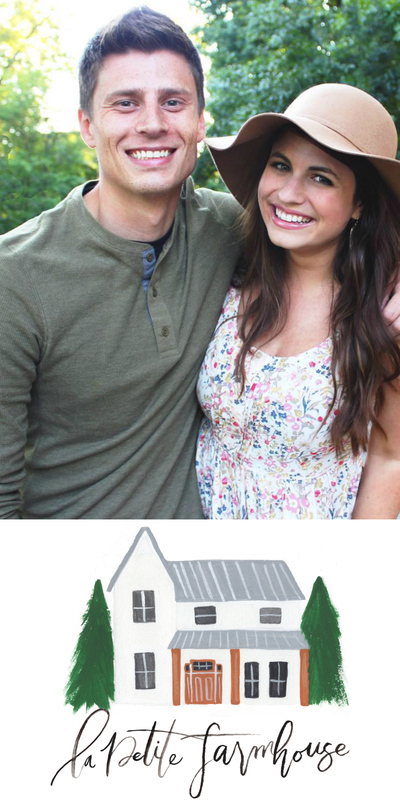 Be sure to check out my tips for easy entertaining at the bottom of the post! 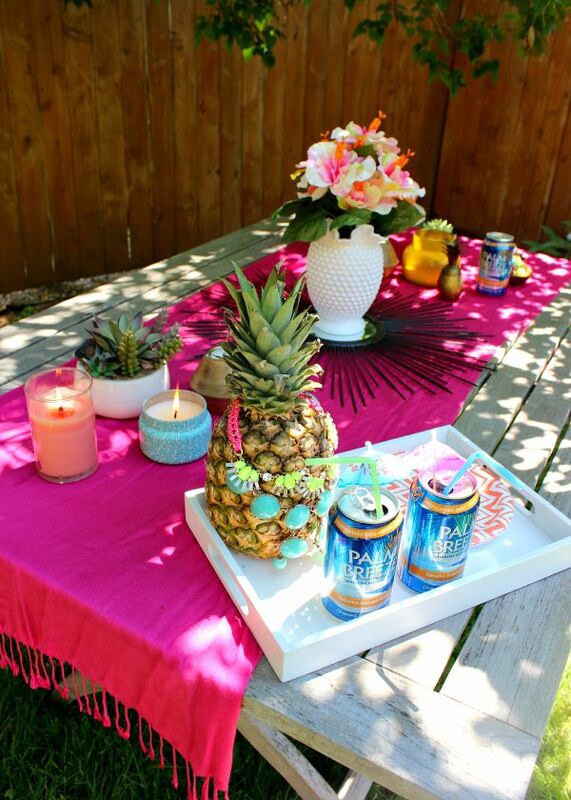 The tablescape for my Hawaiian Happy Hour was inspired by Palm Breeze, our drink of choice- a sparkling alcoholic spritz! It's a flavored malt base that has the perfect balance of sweetness and carbonated bubbles. As I mentioned, I didn't need to stress about the party decor, so all I needed to worry about when prepping for my outdoor soiree was the alcohol (and cupcakes)! I chose the Pineapple Mandarin Orange which was quite tasty with tangy citrus tones. It perfectly set the tropical mood for happy hour- now I want to try the other flavor, Ruby Red Citrus. Get inspired for your next Hawaiian Happy Hour! 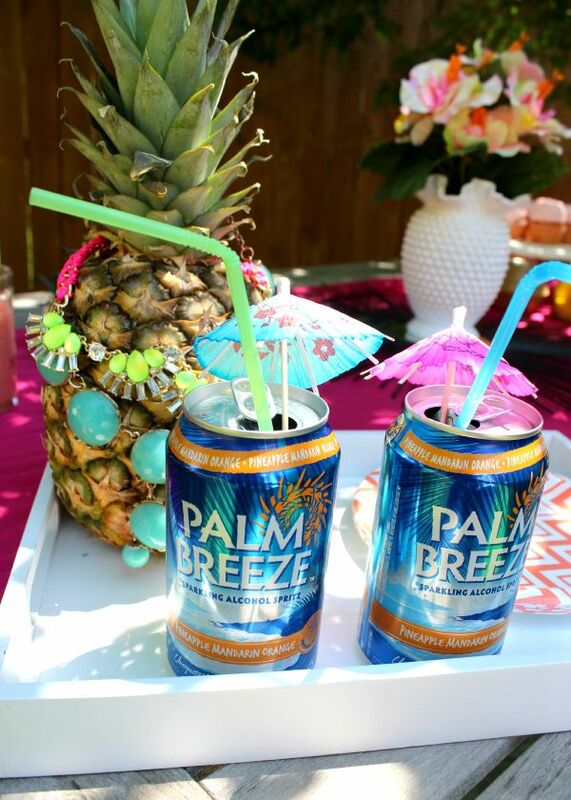 The Palm Breeze drinks were tasty, refreshing and perfect for putting us in a vacation state of mind- even on a week night! The colorful neon straws & drink umbrellas we're the perfect tropical touch. 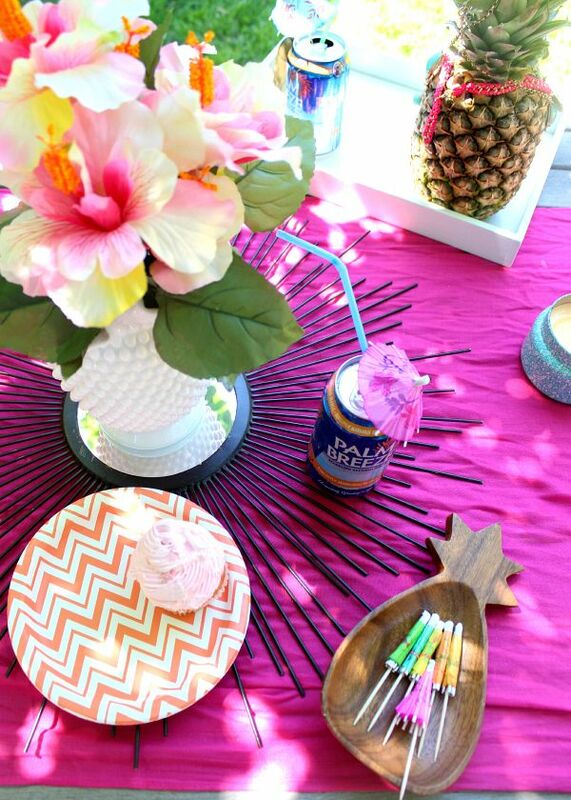 I used pieces from around the house I rounded up for simple, colorful decor to set the mood for our tropical themed happy hour. I also had a fun little ukulele playlist for tunes. 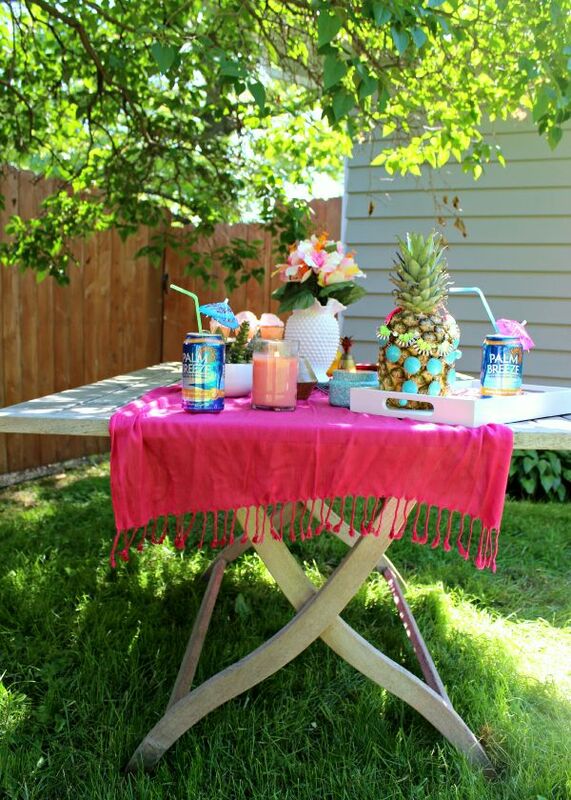 A pink pashmina doubled as a tassel trimmed table runner & pop of color on the table. A white tray we use to round up remotes in the living room was perfect for serving drinks. 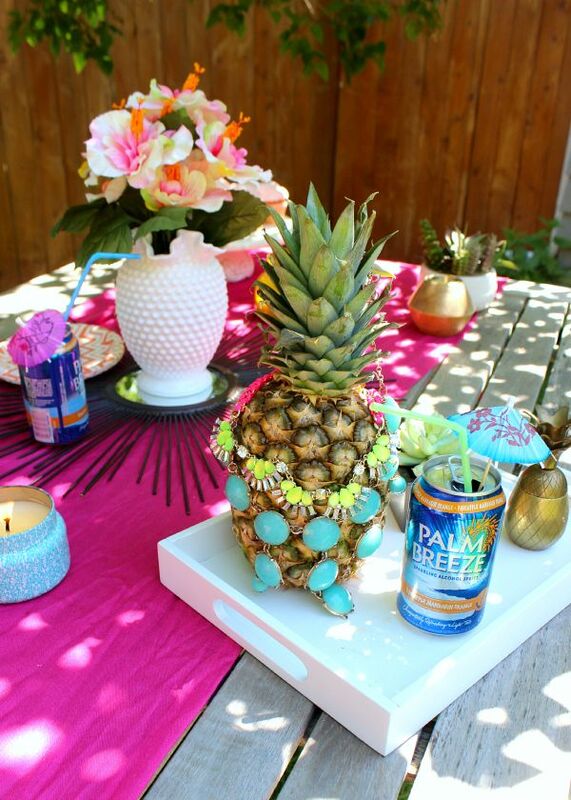 Colorful statement necklaces draped over a pineapple give it extra pizazz. 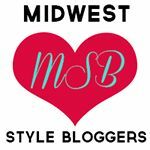 If you love tasty tropical drinks & getting pampered be sure to check out the amazing Palm Breeze/ Blo Bar events happening in Austin & Dallas! 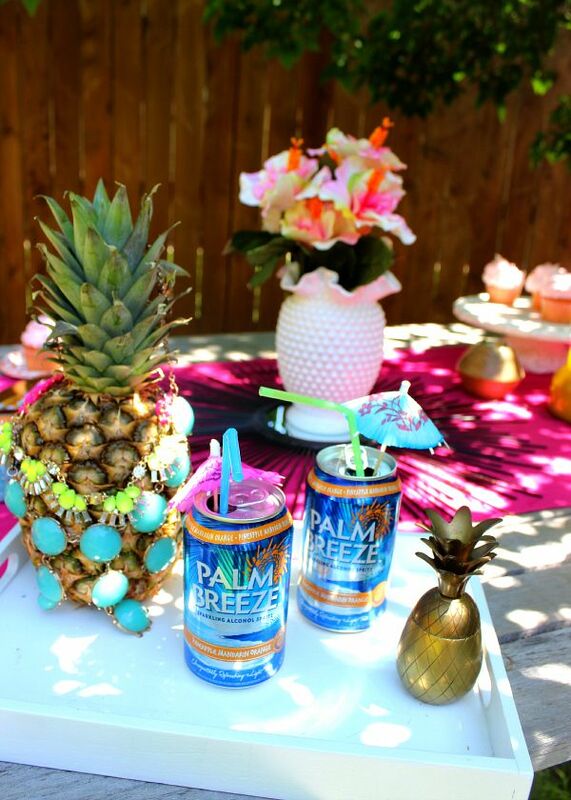 Check out Palm Breeze for your next get together with the girls- it's available at most grocery stores. Here's to every day feeling like vacay this summer. Cheers!